Candace Mumm, center, at her victory party in Kendall Yards. Even in a non-presidential year and in a technically nonpartisan race, Tuesday’s election sent a clear message about the city’s current political leanings. 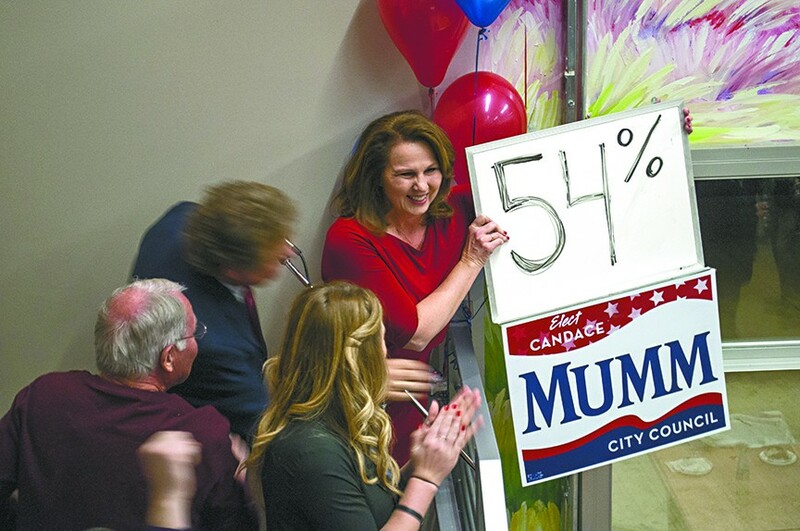 With wins for Candace Mumm and Jon Snyder, the Spokane City Council will shift from a 4-3 conservative majority to a union-backed liberal one. In the contentious bid to fill conservative Nancy McLaughlin’s seat representing northwest Spokane, Mumm led conservative Michael Cannon 54-45 percent as of 10 pm Tuesday. The race drew more than $150,000 in campaign contributions and PAC-funded attack ads on TV and in the mail. In the end, money won the day for Mumm who out-fundraised Cannon by $25,000. The ideological divide was clear as Cannon — who sat on Mayor David Condon’s transition team and chairs the city’s Housing and Human Services Board — aligned almost entirely with Condon. Meanwhile, Mumm stood behind liberal Council President Ben Stuckart. The candidates clashed on whether the city should implement a 1 percent property tax increase in the 2014 budget, whether the council should strengthen the city’s sit-lie law and whether the mayor’s recent moves to increase the number of exempt city positions (in which employees are appointed rather than hired through civil service) were beneficial or dangerous. Michael Cannon at home as results come in. Cannon saw support from Condon, conservative councilmen Steve Salvatori and Mike Allen and a PAC funded primarily by local construction firms, homebuilder groups and City Administrator Theresa Sanders. Prominent local liberals like Rich Cowan, state Sen. Andy Billig and Stuckart lined up behind Mumm, a former TV news reporter and Plan Commission member who worked on Mary Verner’s re-election campaign against Condon. Drawing conservative ire, most of her big contributions came from local and state unions, including firefighters, health care workers and county and city employees. Incumbent Councilman Jon Snyder, a transportation-focused member of the council’s current liberal minority, held his seat representing the South Hill, Peaceful Valley and Browne’s Addition against a challenge from Republican and former state Rep. John Ahern. While their race never got as testy as the other, Snyder criticized Ahern for being short on specifics and energy. Ahern challenged Snyder on whether he’d done enough to make the city business-friendly, promising he’d look to loosen regulations. Snyder says he was confident he’d hold onto his seat Tuesday, but was “thrilled” with the nearly 30 percent margin by which he won. Ahern, meanwhile, warned of the impact union-supported victories could have on the city.